Samantha Everett sees what others don’t. A subtle pinstripe here. A flicker of lace there. The hint of gold that brings an otherwise beige outfit to life. Like a forensic scientist, she finds in the details the stories behind the designs. She turns sleeves inside out, massages hems and parts layers to show how the garments in The Art of Wool would move on the body and in the breeze, pointing out an effect created by a heat-pressed mould, the synthetic fibre woven through the wool to create a particular quality of line, the shape formed by the cut and drape of a silky panel. It’s more than a floor talk: it’s an exposé. A small crowd follows Sam from room to room and aahs at every reveal. The big finale is out the back, where she’s simultaneously running a felting workshop: on every table brilliantly coloured fibres melt together into fabulous tapestries. It’s all part of a residency by the Manning Fibre Artists, a four-part collaboration of epic proportions, called I Wool If You Wool, specifically designed to compliment the exhibition, including eight demonstration days by a range of players orchestrated by Sam. It takes the wall project to new heights. Sam knows her stuff. She was apprenticed to Australian-Japanese fusion designer Akira Isogawa in Sydney, studied at the Glasgow School of Art (yes, the one designed by Charles Rennie Mackintosh) and has rubbed shoulders with the likes of Sass and Bide and Alannah Hill. 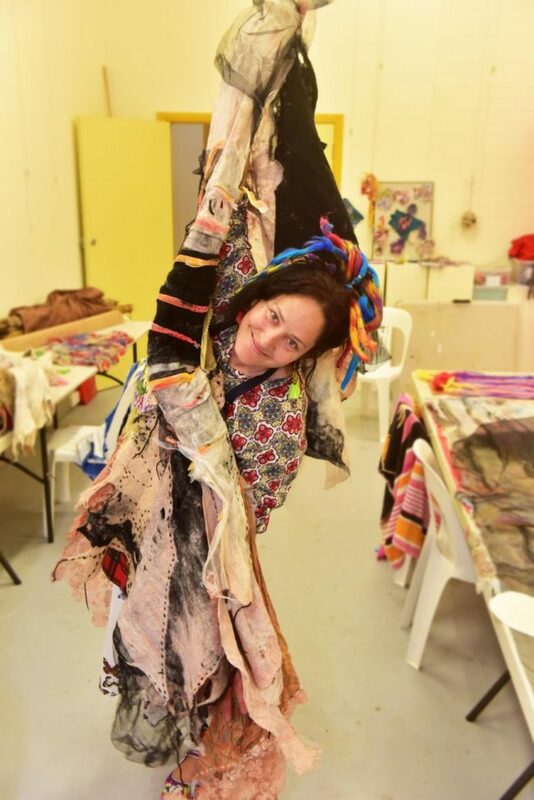 Today Sam runs A Little To The Left, one of the sparkliest of hidden gems, a gallery studio/space on Victoria Street dedicated to supporting emerging artists, proving that a vibrant arts subculture is well and truly alive in the Manning Valley. Check it out at 121-129 Victoria Street, next to Taree Literary Institute. And if you’re still keen to see The Art of Wool, make sure you get there in the next day or two: a new exhibition opens at 2 pm this Saturday. Even if you’ve already seen it, I can highly recommend a closer look.